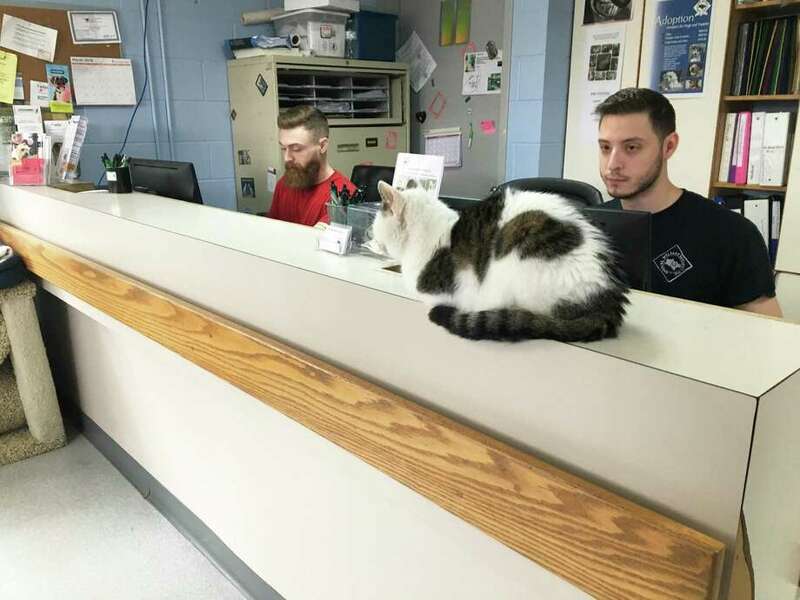 Aarron Pratt and Mike Almedia, staff members at the New Milford Animal Welfare Society, sit at the reception desk with unofficial greeter, Vina the cat. The reception will be enlarged as part of the renovation project breaking ground on April 2, 2019. NEW MILFORD — Vina the cat can often be found perched on the reception desk at the New Milford Animal Welfare Society’s shelter, serving as the unofficial greeter. On a Saturday, the small reception area can be filled with as many as 15 people looking to adopt one of the shelter’s cats or dogs. “It can be difficult to move about,” said Mike Almedia, who has worked there since June. The facility’s space constraints will be addressed in the shelter’s renovation and expansion, which breaks ground on April 2 and is expected to last seven months. The shelter will remain open during the work. “This is going to be a tremendous boost for our dogs, cats and our community,” said Janet Bloch, the society’s president. The project will add 1,300 square feet, which is about a third of the existing space, and include a larger reception area, a conference room, healthy hold and cat maternity areas, a new grooming space and an exam room that will eventually have a surgical space.The existing kitchen and kennels will be renovated. “It will expedite the adoption process,” said Reneé Gardner, the shelter manager. Just around the corner from the reception area is the sole office, which is shared by three people, three dogs and a bird. The hallway has a desk, water cooler and cork board — which serves as the volunteers’ space. The conference room will create an area for training the 20 to 50 active volunteers, as well as a better space for people to get to know the animals before deciding if they want to adopt them. Another challenge in the facility is the second cat room, which is serving multiple functions, including as the grooming and medical areas for staff to do initial inspections and the veterinarian to do the actual exam. The expansion won’t change the number of animals the shelter takes in. About 80 cats and 19 dogs are at the non-destroy shelter now. The society places about 180 dogs and 350 to 400 cats annually. It has a senior-to-senior program that places cats and dogs older than 8 years with senior citizens. Bloch said the recession stalled a plan in 2008 to renovate the shelter, which was built in 1991. They restarted about three years ago when the society received a large donation. Donations are still being collected for the project, but Bloch declined to give a project estimate, saying a final figure is still being worked out. The society’s budget consists 100 percent on donations and grants. Architecture Design Alliance in New Milford designed the project and Old Mill Builders LLC, of Brookfield, is the project contractor. Rosemarry Abbott, a volunteer from Brookfield who comes four times a week, said she couldn’t wait for the expansion.